The medieval parish church was central to most people’s lives, and the Mass, the characteristic pre-Reformation service, exercised a defining influence upon the lives of clergy and laity alike. 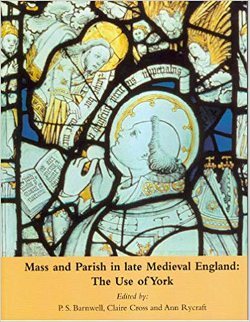 This book, written by authors from different disciplines, explores the importance of late-medieval parish religion against the backcloth of medieval York. How many Parish churches were there? What was the form of the Mass and how was it celebrated? How were the church interiors arranged and how were they decorated? What contribution did music make? What was it like to be a cleric at the time? What changes did the Reformation bring? A substantial appendix provides a reconstruction of the pre-Reformation Mass as celebrated in York. This is a real work of scholarship by authors who are leaders in their specialism, and essential reading for all interested in the middle ages. Sanctus, Sanctus, Sanctus, Dominus Deus Sabaoth. Pleni sunt cæli et terra gloria tua. Hosanna in excelsis.